What is a deep cleaning? Do I really need one? Also please read the last paragraph about localized antibiotic placement, it's important! Why do I need a "deep" cleaning instead of a regular cleaning? So you went to the dentist and he/she told you that you need a deep cleaning. Maybe they even called it "Scaling and Root Planing" . Doesn't that sound nice? Hopefully this blog entry will help you understand a few things about deep cleanings. I could write pages on this topic, I'll try to keep it brief. There ARE dentists out there that are telling their patients they need deep cleanings when they do not, there are also a LOT of patients that need a deep cleaning that are only getting a "regular" cleaning done at their 6 month dental visits. Your dentist or hygienist should check your gums at each cleaning visit for the signs of any gum infections. If you go more than 12 months between cleanings, you may need a deep cleaning on your first visit back to get your mouth back to proper health status. Click HERE to see the after photos of the case above. The simple explanation for why you need a deep cleaning is this: You have an infection in the tissues (gums and bone) surrounding your teeth. The main cause for this infection is tartar that is stuck on your teeth below the gum line. Bacteria love to live in tartar. The types of bacteria that live in tartar make some pretty nasty toxins. One of the most obvious toxins are sulfur containing molecules, BAD BREATH molecules!!! Yes those little bacteria make your breath pretty nasty. I can always tell the guy at the gym with the infection in his gums, he's breathing hard and everyone around can smell it. It's different than onions or garlic breath, it has it's own special smell. Swollen and bleeding gums, especially when you brush your teeth, are another tell tale sign. Some people abandon brushing all together because they say it hurts their gums and they don't like to see the blood. As the infection progresses your teeth will begin to get loose and "pockets" will form around the tooth. That's because the bone is pulling away from the tartar and tooth. Remember the old saying, "getting long in the tooth"? Before we treated these infections people would lose bone around their teeth as they aged and their teeth would get longer (actually the gums were receding with the bone making the tooth appear longer). It was very common as dental cleanings were not always a priority (or even done at all). One way to maintain a younger appearance is to keep up on your 6 month cleanings. How do I get rid of the tartar and bacteria inside the tartar? Tartar sticks to your tooth like barnacles stick to the bottom of a boat. Brushing and flossing won't remove the tartar once it has attached to your tooth. Neither will antibiotics or fancy oils. It has to be scraped off. In the dentist office we use a dental scaler and/or an ultrasonic scaler (vibrates real fast and removes tartar efficiently). Because the tartar extends down below the gum-line it hurts to scrape it off. Also the gums develop ulcers on them due to the toxins released by the bacteria. These ulcers are very sensitive. Because of the potential pain, we usually need to get our patients numb before we start removing any tartar below the gum-line. Visiting the dentist every 6 months helps remove the tartar before it starts growing below the gum-line. Some people make more tartar than others, and need their teeth cleaned every 3 or 4 months. A deep cleaning goes below the gum-line to remove tartar and clean the tooth surface, a regular cleaning is above the gum-line only. Once the tartar is gone the bacteria have nowhere to live and your body can clean up the rest. Just be sure to follow up regularly with your dentist/hygienist. Sometimes an antibiotic is prescribed, most often just a mouth rinse. 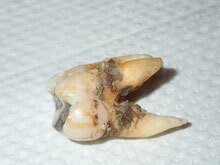 This tooth had to be extracted because the tartar was too far down the roots to be cleaned predictably. Localized antibiotic placement. Please read this! I wish this paragraph was at the top of the page, but it isn't. I had a good friend whose wife was getting her teeth cleaned faithfully every 6 months. She had excellent home care, but she was pregnant and developed a few "pockets" (probably pregnancy gingivitis in my opinion). Her dentist (not me) recommended she have a deep cleaning AND localized antibiotics placed in EACH pocket at a cost of over $400. NO NO NO NO NO! If a dentist gives you a treatment plan for antibiotics placed in EACH pocket, RUN! It's a money making dental strategy! Localized antibiotics come AFTER the first deep cleaning and AFTER allowing time for the sites to heal. They are used only if the infection/pocket did not get better with the initial deep cleaning. It is usually 1 or 2 sites if you need it at all, not your entire mouth! You can spend $300-$1200 on these localized antibiotic placements. It's a scam (if you ask me). It makes those people that need deep cleanings skeptical of dentists, and I can see why. FYI: Another gum infection treatment that shows little to no benefit (in the current dental literature) is disinfecting/sterilizing the pocket with a laser. The current research is clear, Laser pocket disinfection doesn't do anything more than traditional scaling and root planing already does.